I love the Yanko Design website. It has so many cool concepts. Recently while browsing the site I cam across the Grabit, “a door handle fitted with a fingerprint scanner” (image to the right). I immediately thought of pharmacy. It would be cool to see one of these attached to all the refrigerators in the pharmacy. Anytime you wanted to get something out of the fridge you’d simply place your thumb on the fingerprint scanner as you grabbed the handle to open the door. The Grabit handle would register your fingerprint and identify you as someone that had access. And if not, you wouldn’t be able to get in. This would work well for high dollar items that you wanted to track or controlled substances that require refrigeration. After seeing the Grabit handle on the Yanko Design website I started looking into other ideas for refrigerators, and what better place to look for pharmacy refrigerators than Sears. All joking aside, I figured it would be better to look at consumer refrigerators because let’s face it; pharmacy refrigerators don’t exactly have a great track record for being cutting-edge technology. 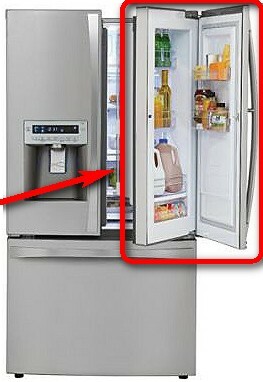 One of the refrigerators that I thought was pretty cool was the Kenmore Elite Gran-N-Go French-Door Refrigerator. This refrigerator has a small door within a door. The Grab-N-Go door keeps often-used items in a small compartment accessible via a simple push button on the handle. 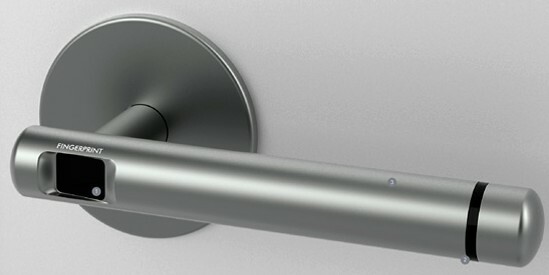 The design lends itself to the Grabit door handle design. The outer door with the push button could easily be fitted with a fingerprint scanner on the button to limit access when appropriate, while giving everyone access to the rest of the refrigerator. Who wants to help me build it? I really need to learn how to use some type of software like Photoshop. These ideas would look so much cooler if I had a snappy image to go along with ’em. As is mine, Tom. As is mine.